Earls Court Studios are just a few minutes from Earl’s Court Station, which is situated on the Piccadilly and District lines. From Earl’s Court Station exit onto Warwick Road. 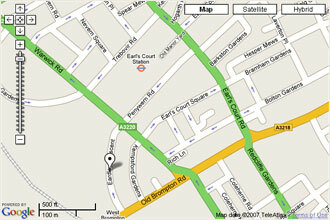 Go left and then right onto Eardley Crescent where Earls Court Studios are located.